This handmade copper bracelet is non magnetic, so no magnets are added. Sergio calls this Peace Copper. 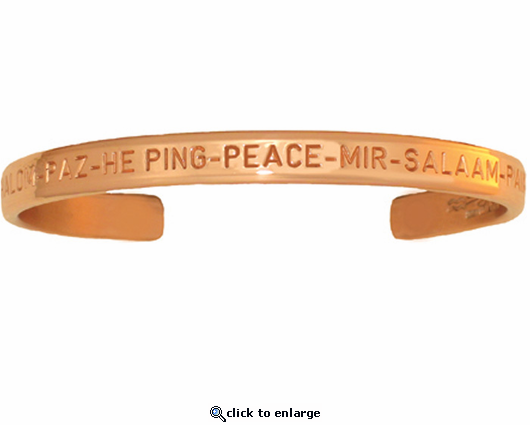 It is made with pure copper engraved with the word "Peace" in the following languages; Arabic, Chinese, English, French, German, Hebrew, Hindi, Russian, and Spanish. It is made of pure copper. No plating is used and it is Made in USA. Beautiful copper bracelet. So many compliments and the symbol of peace are all easily recognized. Not sure about the magnets yet. I have been wearing this bracelet almost daily since 2009 and it gets more beautiful with age.